Background: Posterior fossa tumours are the commonest childhood brain tumours with diverse clinical presentations, treatment modalities and postoperative outcomes. The literature has limited description of postoperative complications following surgery for these tumours. Objective: The aim of this study is to analyse the postoperative complications, which occur after PFT surgery in children. A brief overview of the in-hospital mortality and management of these complications presented. Materials and Methods: This is a retrospective chart review of children who were operated for PFTs. The occurrence of complications during the postoperative period was noted. Complications management, in-hospital mortality and overall survival was also recorded until the time of discharge. The complications are divided according to the modified Clavien-Dindo classification and outcome was stratified accordingly. Results: 79 (60.3%) males and 52 (39.7%) females with a mean age of 8.15 ± 3.3 years. The mean duration between symptoms onset and diagnosis was 35.3 ± 16.6 days. Overall, there were 53 (40.5%) cases of medulloblastoma, 40 (30.5%) cases of ependymoma, 34 (26.0%) cases of pilocytic astrocytoma and only 4 (3.1%) cases of atypical teratoid/rhabdoid tumours. Twenty-five (19.1%) patients developed hydrocephalous postoperatively. The most common complication was postoperative incisional CSF leak, which occurred in 17 (13.0%) patients. Wound infection was noted in 8 (6.1%) patients, eight (6.1%) of patients presented with cerebellar mutism, five (3.8%) patients had bleed in tumour bed, five (3.8%) patients had aspiration pneumonia and 7 (5.3%) patients developed hospital acquired pneumonia. The overall mean length of stay (LOS) was 5.4 ± 2.2 days (range: 3 – 12 days). The overall mortality rate was 9.9% (n = 13). Conclusion: The most common complication is the development of hydrocephalous, followed by cerebrospinal fluid leaks, cerebellar mutism, peri-tumour oedema, tumour bed haematoma and systemic complications such as meningitis, sepsis and postoperative pneumonia. 1. Gnanalingham KK, Lafuente J, Thompson D, Harkness W, Hayward R. Surgical procedures for posterior fossa tumors in children: does craniotomy lead to fewer complications than craniectomy? J Neurosurg. 2002; 97 (4): 821-6. 2. Albright L. Posterior fossa tumors. Neurosurg Clin N Am. 1992; 3 (4): 881-91. 3. Bronstein KS. Epidemiology and classification of brain tumors. Crit Care Nurs Clin North Am. 1995; 7 (1): 79-89. 4. 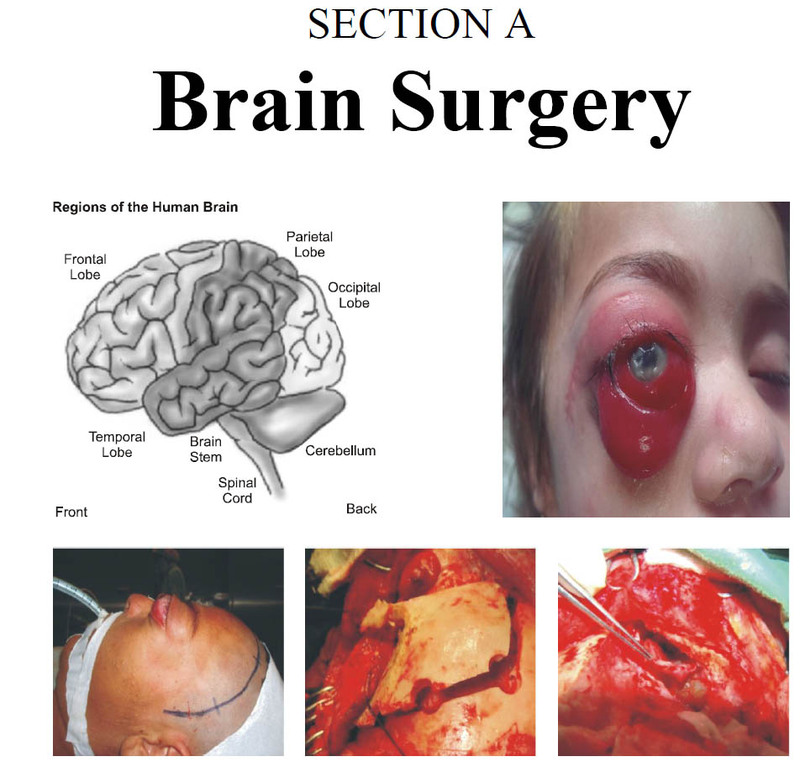 Sen C, L S. Complications of cranial base surgery. In: Post K, Friedman E, P M, editors. Postoperative complications in intracranial neurosurgery. New York: Thieme; 1993: p. 111-33. 5. Hojer C, Hildebrandt G, Lanfermann H, Schroder R, Haupt WF. Pilocytic astrocytomas of the posterior fossa. A follow-up study in 33 patients. Acta Neurochir (Wien). 1994; 129 (3-4): 131-9. 6. Rath GP, Bithal PK, Chaturvedi A, Dash HH. Complications related to positioning in posterior fossa craniectomy. J Clin Neurosci. 2007; 14 (6): 520-5. 7. Heiskanen O, Lehtosalo J. Surgery of cerebellar astrocytomas, ependymomas and medulloblastomas in children. Acta Neurochir. 1985; 78 (1-2): 1-3. 8. Elhassan MMA, Osman HHM, Parkes J. Posterior cranial fossa tumours in children at National Cancer Institute, Sudan: a single institution experience. Childs Nerv Syst. 2017. 9. Rosemberg S, Fujiwara D. Epidemiology of pediatric tumors of the nervous system according to the WHO 2000 classification: a report of 1,195 cases from a single institution. Childs Nerv Syst. 2005; 21 (11): 940-4. 10. Clavien PA, Barkun J, De Oliveira ML, Vauthey JN, Dindo D, Schulick RD, et al. The Clavien-Dindo classification of surgical complications: five-year experience. Ann Surg. 2009; 250 (2): 187-96. 11. Dindo D, Demartines N, Clavien P-A. Classification of Surgical Complications: A New Proposal With Evaluation in a Cohort of 6336 Patients and Results of a Survey. Ann Surg. 2004; 240 (2): 205-13. 12. Sawaya R, Hammoud M, Schoppa D, Hess KR, Wu SZ, Shi WM, et al. Neurosurgical outcomes in a modern series of 400 craniotomies for treatment of parenchymal tumors. Neurosurgery, 1998; 42 (5): 1044-55; Discussion 55-6. 13. Cao Y, Pu K, Li G, Yan X, Ma Y, Xue K, et al. The Role of Antibiotic Prophylaxis in Clean Neurosurgery. World Neurosurg. 2017; 100: 305-10. 14. Dubey A, Sung WS, Shaya M, Patwardhan R, Willis B, Smith D, et al. Complications of posterior cranial fossa surgery--an institutional experience of 500 patients. Surg Neurol. 2009; 72 (4): 369-75. 15. Selesnick SH, Liu JC, Jen A, Carew JF. Management options for cerebrospinal fluid leak after vestibular schwannoma surgery and introduction of an innovative treatment. Otol Neurotol. 2004; 25 (4): 580-6. 16. Steinbok P, Singhal A, Mills J, Cochrane DD, Price AV. Cerebrospinal fluid (CSF) leak and pseudomeningocele formation after posterior fossa tumor resection in children: a retrospective analysis. Childs Nerv Syst. 2007; 23 (2): 171-4; Discussion 5. 17. Due-Tonnessen BJ, Helseth E. Management of hydrocephalus in children with posterior fossa tumors: role of tumor surgery. Pediatr Neurosurg. 2007; 43 (2): 92-6. 18. Culley DJ, Berger MS, Shaw D, Geyer R. An analysis of factors determining the need for ventriculoperitoneal shunts after posterior fossa tumor surgery in children. Neurosurgery, 1994; 34 (3): 402-7; Discussion 7-8.